February 27, 2012  The Artist became the first silent film to triumph at Hollywood's highest honors since the original Oscar ceremony 83 years ago. 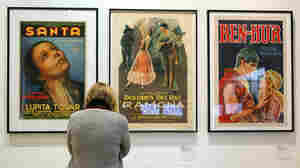 The film's lead actor Jean Dujardin also took home an Academy award for best actor while Michel Hazanavicius, the film's director, also won. 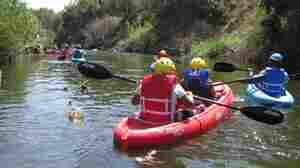 September 20, 2011  Los Angeles city officials have opened once-polluted and often-ridiculed Los Angeles River to kayaks and canoes. NPR's Mandalit del Barco rode on it with a group of 10-year-olds and a City Council member — where they discovered herons, carp and 32 discarded shopping carts. 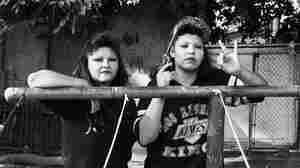 September 6, 2011  Seventeen years ago, BooBoo was a hard-core gang member in Los Angeles. Now, Cindy Martinez is a mother of five who teaches her kids not to make her mistakes. 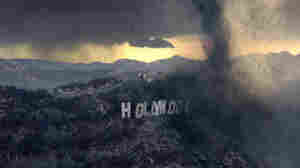 August 9, 2011  From Earthquake to The Day After Tomorrow, why have filmmakers always loved demolishing L.A.? We offer a list of movies in which the city is attacked by aliens or killer robots, plagued by zombies and (most frequently) crushed by natural disasters. August 4, 2011  Airlines have been struggling this summer because of higher oil prices. Now they're getting a windfall profit thanks to Congress. Although they don't have to pay aviation taxes during the partial FAA shutdown, they have not lowered fares accordingly; they're keeping the difference. 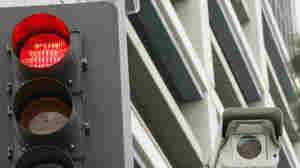 August 3, 2011  The city did away with its red light camera program, which sent photos of moving violations to drivers, along with fines of nearly $500. It turns out the courts weren't following up on the citations; the tickets don't show up at the DMV or on insurance or credit records. "If you don't pay it," one City Council member said, "nothing happens." 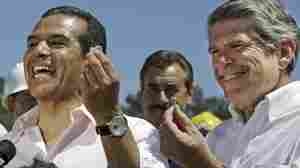 July 18, 2011  Los Angeles officials have reopened a major interstate freeway that was closed for construction. Fearing traffic jams of epic proportions, many drivers stayed off the roads over the weekend. But cars were back on Interstate 405 a day ahead of schedule. July 14, 2011  Southern Californians are calling it "Carpocalypse" and "Carmagaddon." This weekend, Interstate 405 in Los Angeles will shut down completely for construction. The closure is causing a certain amount of panic. July 10, 2011  William and Kate, the Duke and Duchess of Cambridge, are visiting Southern California this weekend, combining red carpet glamour and charity work. Prince William played polo in Santa Barbara, with his bride awarding the winning trophy. NPR's Mandalit del Barco reports from the scene on the match, the hoopla and the hats. July 8, 2011  Prince William and Kate, the Duke and Duchess of Cambridge, visit Southern California this weekend. They'll hobnob with celebrities, meet veterans, inner-city children and attend a polo match. 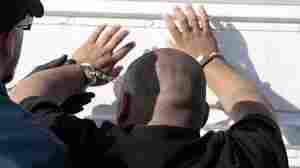 June 14, 2011  A gang in Azusa is accused of waging a two-decade campaign of violence to drive out the city's black residents. Now dozens of alleged Varrio Azusa 13 members are charged with racketeering and civil rights violations. One resident calls the arrests "an amazing victory." June 7, 2011  Los Angeles is bracing for what happens when California releases more than 30,000 inmates from the state's prison system. The U.S. Supreme Court has ordered counties and other states to help ease state prison overcrowding, but L.A. jails already are well over capacity. Is The L.A. Food Truck Bubble Ready To Burst? 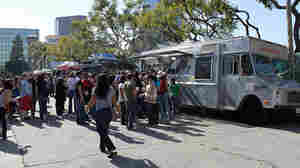 May 18, 2011  With more and more entrepreneurs starting up food trucks in Los Angeles — and corporate trucks like Domino's getting into the act — some fear the once-underground foodie scene has been co-opted. And some food bloggers and trend watchers are predicting the movement's demise. May 5, 2011  La Plaza pays tribute to the complex histories and identities of Mexicanos, Californios, Mexican-Americans and Chicanos: everyone from musicians in the group Ozomatli to the 44 settlers who arrived from Mexico in 1781 to establish the city of Los Angeles.